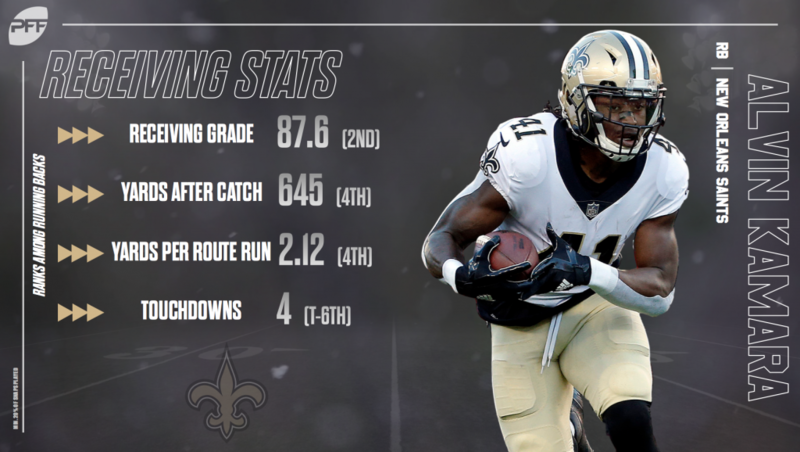 Michael Thomas has been one of the NFL’s best wide receivers since he entered the league in 2016. This past regular season, he finished with an elite grade of a 91.3, which was the second-highest among wide receivers. When the New Orleans Saints defeated the Los Angeles Rams in Week 9, Thomas posted his highest single-game grade of the season (92.6) and totaled 211 receiving yards along with one touchdown. Though he torched the opposition’s secondary in Week 9, the Rams were down a key defender in that matchup: Aqib Talib. When Round 2 happens on a bigger stage and with the NFC title on the line, Talib will be on the field and will most likely be glued to Thomas. Over the past three seasons, Talib has been one of the best cornerbacks in the NFL and has consistently shut down teams’ number one wide receiver. 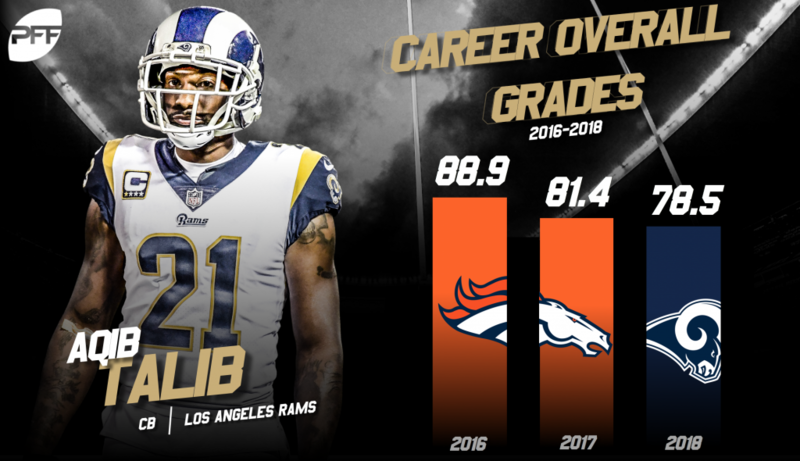 In 2016 when Denver won the Super Bowl, Talib finished with an 88.9 overall grade which was the third-highest among cornerbacks as well as a 49.5 passer rating when targeted which ranked second. Having an All-Pro with playoff success such as Talib back in the Rams secondary will bolster the unit that struggled against the pass in his absence. This season, Talib suffered an injury that kept him on the sideline for six weeks but has found success since returning to the field. Since Week 15, Talib has earned a 79.5 overall grade which ranks fifth among cornerbacks during that span. On top of this, he totaled a 79.9 coverage grade which ranked fifth, and he snagged one interception as well as one pass breakup. Having Talib back in the lineup has already made a huge difference in the Rams secondary, and opposing teams’ quarterbacks have not found much success through the air while targeting at the All-Pro. Last week, when the Rams picked up a 30-22 victory over the Cowboys, Talib stepped up to the plate and shut down Amari Cooper when he was covering him. Talib earned a 74.1 overall grade and finished with a 47.9 passer rating when targeted, and while covering Cooper, he allowed two receptions that went for a mere 14 yards. If Talib can have this kind of success against Thomas on Sunday, the Saints will need someone other than their All-Pro receiver to step up to the plate in order to secure the NFC crown. If Talib can shut down Thomas on Sunday, two receivers that Drew Brees could look to call on are Ted Ginn Jr. and Tre’Quan Smith. Although Ginn has been injured for the majority of the season, he has been a steady deep-threat and a reliable target for Brees during his time in New Orleans. Ginn is seeing 37.9% of his targeted passes 20 or more yards downfield, he and is averaging 12.3 yards per catch. His most impressive game of the season came in Week 16 against the Steelers, where he saw eight targets and hauled in five catches for 74 yards and finished with an 89.3 overall grade. Though Ginn finished with a below average grade of a 59.4 against the Eagles last week, he could take advantage of a favorable matchup against Rams’ cornerback Marcus Peters on Sunday. After finishing with an impressive 81.3 overall grade last season, Peters finished this season with a 60.1 overall grade which ranked 74th out of 86 eligible cornerbacks. In coverage, Peters has allowed a 112.6 passer rating, a 69.5% catch rate and has given up 272 yards after the catch. Peters’ below average play this season and Ginn Jr’s resurgence in Week 16 will make this an exciting matchup to watch as the game plays out on Sunday. Saints’ rookie receiver Smith can take advantage of his 6’1’’ frame and haul in passes from Brees deep down the field. On deep passes this season, Smith has 44.4% reception percentage which ranks second among rookie receivers, and he has scored two touchdowns. On top of this, Smith has snagged 63.6% of his contested targets and has a 136.7 passer rating when targeted, both of which lead rookie wide receivers (min. 25 targets). In Week 9 against the Rams, Smith saw three targets and hauled in two of them, which included a touchdown catch when he beat Lamarcus Joyner for a 19-yard strike. Another player that Brees could utilize in the passing attack is Alvin Kamara, who finished the season with the second-highest receiving grade among running backs (87.6). In addition to this, Kamara finished with 645 yards after the catch and averaged 2.12 yards per route run which both ranked fourth among running backs. Kamara also snagged four touchdown receptions this season, which was tied for the sixth most among running backs. Brees may have to find success outside of throwing to Thomas on Sunday, but his numbers haven’t been great doing so this season. Brees has a 124.5 passer rating when throwing to Thomas this season, but takes a dip among his other receivers. On the season, he has an 89.6 passer rating when targeting Ginn which is a significant drop off from his numbers with Thomas. Ginn’s 59% reception percentage and Smith’s 65% is also significantly less than Thomas’ 86%. It is evident with the return of Talib in the Rams’ lineup that Drew Brees will have to survey other options in the passing attack on Sunday. When diving into the numbers, it is clear that players like Ginn Jr, Smith and Kamara are all more than capable of making an impact against the Rams if Thomas is shut down by Talib. If the Saints want to win the NFC crown, Brees will have to take advantage of other favorable matchups to secure their spot in Atlanta on Sunday.